AUSTRALIAN shares are set to drop for a fifth straight session following heavy overnight losses on Wall Street, as weak forecasts from chipmakers added to continued fears over the impact of tariffs and China's slowdown. The SPI200 futures contract was down 94 points, or 1.62 per cent, to 5,700.0 at 0700 AEDT on Thursday, signalling another opening plunge for the local market after energy and materials shares drove it lower on Wednesday. The Australian dollar is buying 70.63 US cents, down from 70.99 US cents on Wednesday. Analysts see October as a typically productive month for the ASX due to the distribution of dividends, but the market is down 6.1 per cent so far and on track for its worst month in more than three years. The tech-heavy Nasdaq composite bore the brunt of the sell-off, leaving it more than 10 per cent below its August peak, what Wall Street calls a "correction." The Dow and S&P 500 erased their gains for the year. Technology stocks and media and communications companies accounted for much of the selling. AT&T sank after reporting weak subscriber numbers, and chipmaker Texas Instruments fell sharply after reporting slumping demand. "Investors are on pins and needles," said Erik Davidson, chief investment officer at Wells Fargo Private Bank. "There has definitely been a change in sentiment for investors starting with the volatility we had last week. The sentiment and the outlook seems to be turning more negative, or at the very least, less rosy." The S&P 500 lost 84.59 points, or 3.1 per cent, to 2,656.10. The index is now off about 9.4 per cent from its September 20 peak. 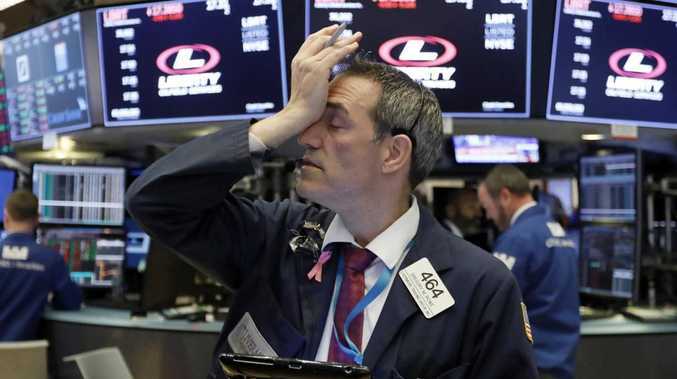 The Dow tumbled 608.01 points, or 2.4 per cent, to 24,583.42. The tech-heavy Nasdaq slid 329.14 points, or 4.4 per cent, to 7,108.40. That's the Nasdaq's biggest drop since August 2011. The Russell 2000 index of smaller-company stocks gave up 57.89 points, or 3.8 per cent, to 1,468.70. Bond prices rose, sending the yield on the 10-year Treasury note down to 3.11 per cent from 3.16 per cent late Tuesday.